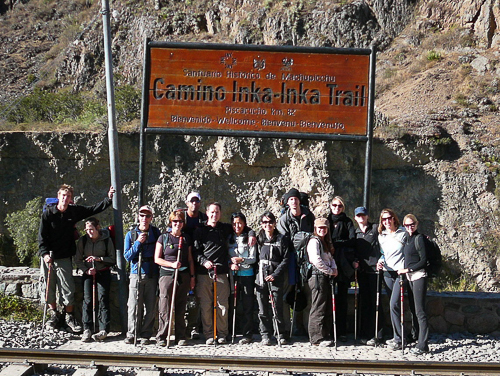 Having not done much trekking in my life, I can’t say where the Inca Trail Trek rates in terms of difficulty. What I can say is that with a porter to customer ratio of 1.4 porters for every customer (plus a chef and two guides), I have to think that this might be on the cushy side…and it was still a lot of hard work! 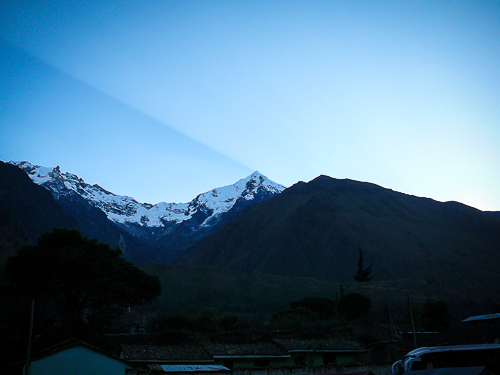 Due to an impending strike in Cusco, we left the night before we were scheduled to leave – sneaking out of town under the cover of darkness. About an hour into the trip the road became littered with rocks and tires as protesters realized that buses would be trying to leave early. Our little convoy suffered a few thrown rock blows as we pushed our way through at top speed. There was no damage other than a few frayed nerves of those of us on the bus that are not used to that kind of welcome. The driver, guides and porters on board just took it in stride. We arrived at camp in the middle of the night and settled in for a short sleep. I awoke the next morning eager to see where we were. Pushing open the tent flap all I could see were towering mountains, a slight hint of frost on the ground, and the sun just starting to rest on the peaks. I could tell right then that the next few days were going to be amazing. As I rubbed the sleep out of my eyes, a porter appeared with hot tea and another brought a bowl of hot water and soap for me to wash up with. Seriously…cushy I tell you! I drank my tea, washed up and packed up the few things I was responsible for in the tent (the porters dismantle and carry everything except my personal belongings). Breakfast was served in a large tent and would have been considered decadent at sea level, never mind in the middle of nowhere at 3300M. First, coffee and chocolate with bread and jam. Then chicken crepes…seriously! 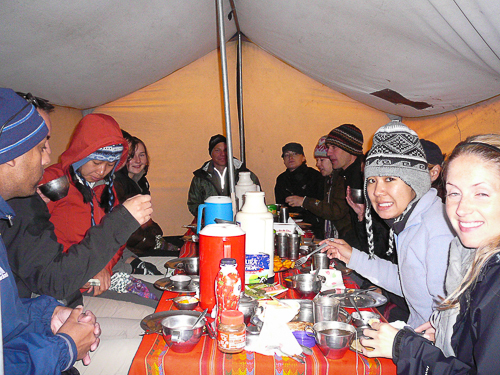 Breakfast was our first opportunity to meet the rest of the trekkers that we would be spending the next 4 days with. As we laughed and joked our way through breakfast, and finally got around to the introductions we realized that this group was going to get along just fine. In fact, in the end, I would say that it’s likely that we couldn’t have done it with a better group of people. I don’t think I ever heard a negative word throughout the whole trip. Some had hiked and camped before, for others this was a first – all were eager and willing to do whatever it took. We all hiked at a similar pace, chatting and laughing our way through. Thanks to all of you (if you’re reading) for making it so much fun! After breakfast we started in on the hiking. 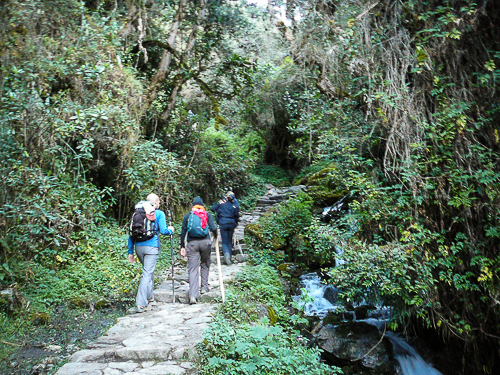 The first day of hiking wasn’t too strenuous – fairly level with a few ups and downs. 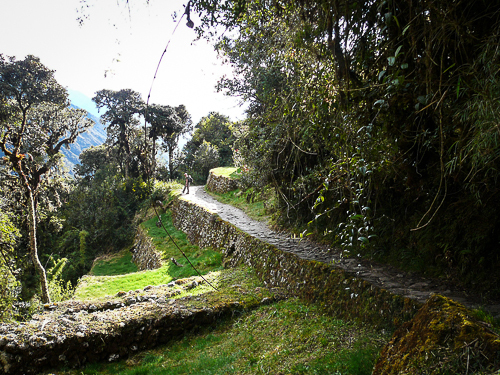 Our guide, Marco, stopped us at various points along the way to tell us the history of, not only the trail and the ruins along the trail, but also of the Incan people and their struggle to survive. 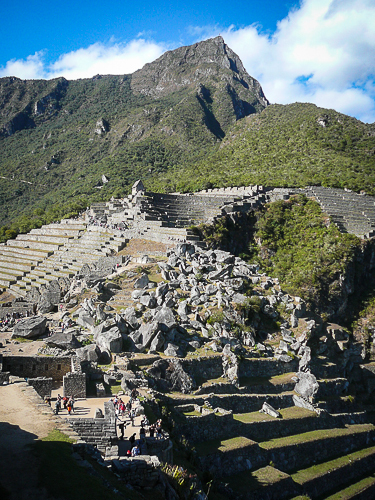 Marco was passionate about his ancestors story and, as time went on, we realized that he was not just telling us stories that come from guidebooks but that his knowledge was much deeper. 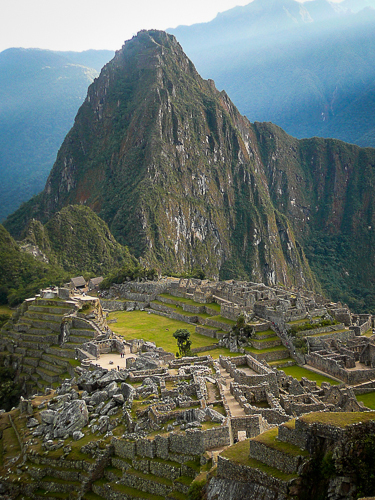 He had not only spent time at university studying but had also spent time in the mountains with the Incan descendants and so had a unique perspective on the area. We hiked a total of 14KM the first day reaching camp just before the sun set over the mountains and valley and the cold really set in. We enjoyed a ‘teatime’ snack and then relaxed a bit before dinner was served. Seriously a lot of food – I was worried I might gain weight while trekking! After dinner we settled into our tent to play a little cards before heading off to sleep…the next morning would come early. 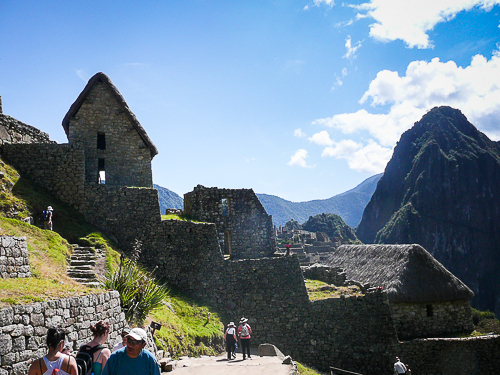 The second day of hiking was advertised as a doozy…and it didn’t disappoint. 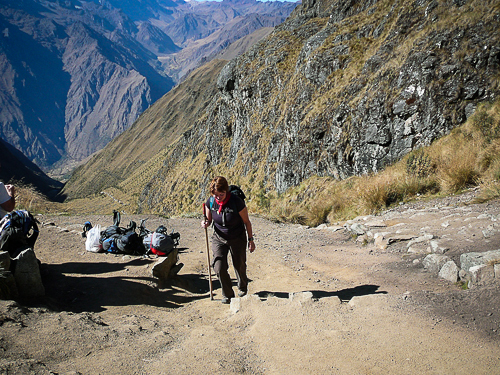 Up and out early, our first half of the day was to climb 900M to Dead Womans Pass. As our group was dominated by women, we only hoped that it would not be one of us that would the the Dead Woman at the end of the day! We could see the pass from our starting point, taunting us to see if we had the mettle. We were a determined group though and, heads down, we trudged our way slowly passing others along the way. 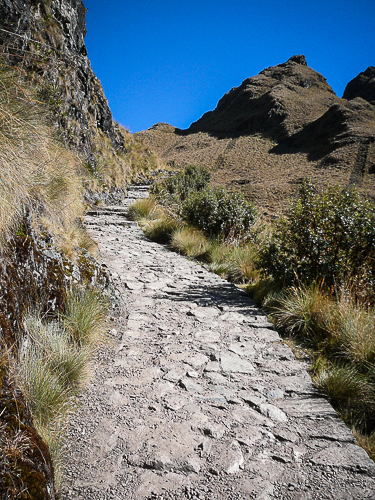 The scenery was breathtaking, but difficult to take in as taking my eyes off the uneven trail for even a second surely would mean a twisted ankle…or possibly worse (I had seen countless casted arms in Cusco the previous week). As the trail climbed upwards it got steeper and, as the air grew thinner with every step, breathing became more and more difficult. My legs felt like lead for the last push but I just kept putting one in front of the other until I could see the post at the top and then, with a burst of energy, I finished it off. Adrenaline is a beautiful thing, and I jumped around like a madwoman hooting and hollering. 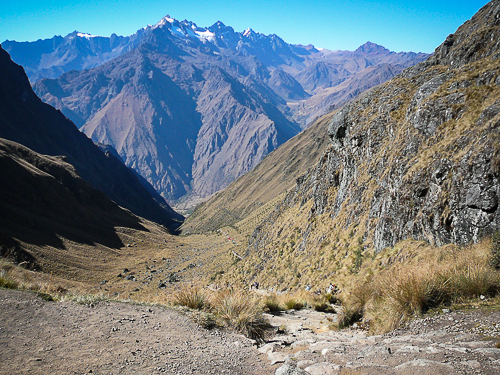 Then it was down the other side – a 600M drop along a beautiful stone pathway cutting down into the valley below. If I thought this was going to be the easy part, I was wrong. Controlling those floppy, leadened legs was an exercise in concentration. However, breathing was definitely easier giving me an opportunity to chat with a trekmate about his travels as we watched the scenery go by. Lunch was at the bottom of the valley and would have been much more relaxing if the next climb had not been fully in view, taunting us as we enjoyed our meal. 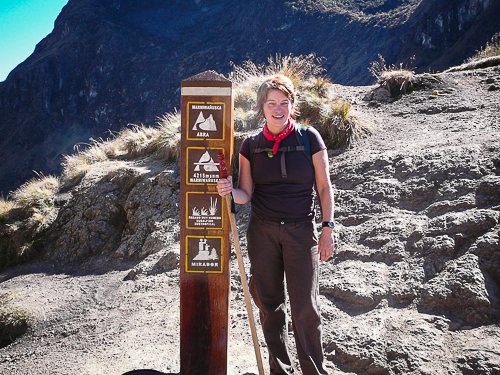 The afternoon saw us climb another 400M before dropping into another valley that was more jungle than scrub. 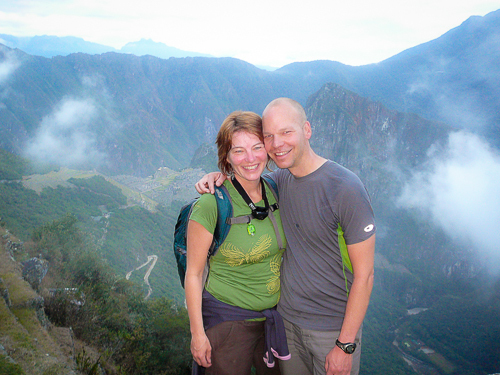 We crossed the valley to find our campsite overlooking a set of astrological ruins as well as a stunning valley. Fog set in just as the light faded lending an eerie feel but also providing some insulating warmth. After 16KM of hiking through two passes, it didn’t take much of the special ‘rum tea’ to send us all off to bed! The following day was relatively easy. Four hours, down almost the whole way – a reported 2000 steps. I didn’t count but my legs were more sore from this than from any other part of the trek! 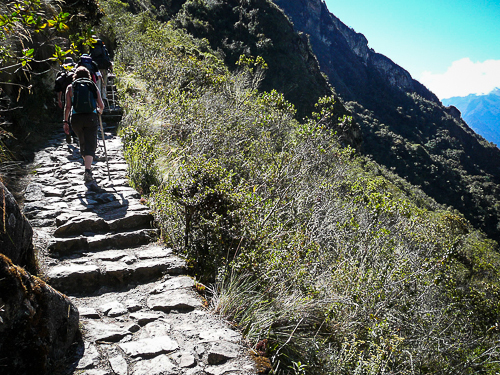 The end of this hike found as the last point before entry to Machu Picchu. It was here that all the groups on the trail, and from other trails, congregated to wait until dawn for the big reveal. There were hot showers to be had (and desperately needed, let me tell you! ), beers to be quaffed and a restful afternoon to be enjoyed. Our 3:30AM wakeup call came very quickly. We packed up in the dark and rushed through our breakfast to get on the trail….and wait. Not far from camp there is a gate that is not opened until 5:30AM, so the 200 or so trekkers from camp all lined up waiting for the time to come. At last the gate opened and we all rushed through, eager to get to the Sun Gate before the sun broke. The one hour hike was not strenuous but was made more difficult by the intense darkness. Looking back I could see a snake line of headlamps slowly making it’s way through the terrain I had just negotiated – reminded me of night riding and how the whole world is only the 5 feet ahead that the lamp illuminates. 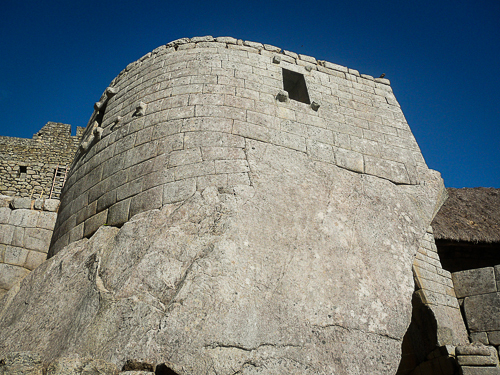 One last push up and suddenly we were there…we passed through the Sun Gate and Machu Picchu was laid out before us. It was kind of surreal. After all that work we had finally made it.